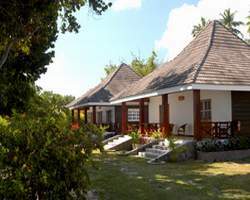 The chalets are situated in a tranquil and exotic vegetation of coconut and takamaka trees. facing L'Union beach, these chalets have a breathtaking view of praslin island. It is only 15 minutes by oxcart from the La Digue jetty. Better still, the chalets are located only 100yards from the exqusite Source D'argent beach. Each of the 4 chalets are fitted with modern amenities and each chalet has 2 ensuite bedrooms and air-con throughout. There is also a living/dining area and fully equipped kitchen. Each Chaet can comfortably take 4 persons and extra children can be accommodated.